My DBT Life will be making some changes! We will be adding a mid-week post and possibly some other additions, but for now, look for something new by 05-19-10! Here is the alleged 'checklist' I have been raving about! Before we begin I feel strongly compelled to give a disclaimer. The material for this checklist is not my own. It is from Marsha Linehan's book Skills Training Manual for Treating Borderline Personality Disorder. Although the format and wording is not the same as what her book has, it is the same concept. Back to our discussion on factors that are reducing our effectiveness. We have discussed whether we are lacking the skill, whether worry thoughts may be getting in the way, whether our emotions are interfering, and now we are deciding whether indecision might be a factor. 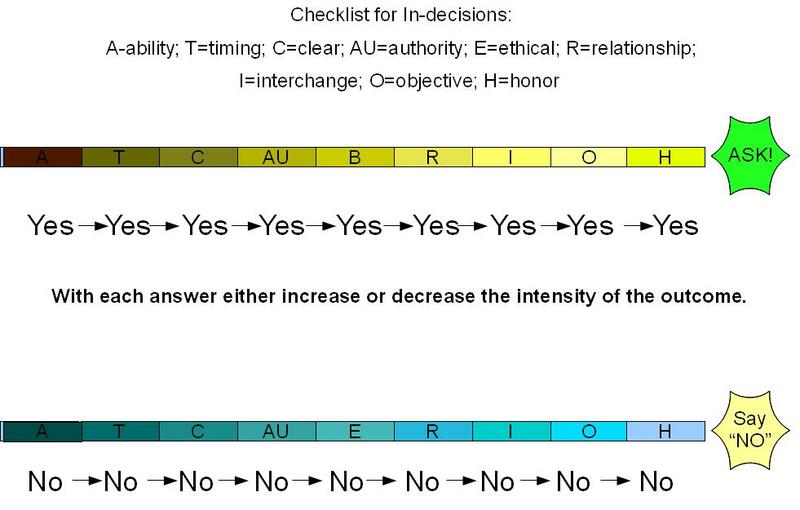 For the first row, when to ask for something and when not to; with each yes answer you increase the level of intensity. If you get all “No's” then you do not ask at all. The key here is that you accept that you will not be asking and you do not mope, pout, or hint about what it is that you would like to ask. Accept that at this time you will not be asking. It does not mean that you will never be asking. You want to ask your boss to give you an hour and a half for lunch because you legitimately need extra time to rest so that you can be productive the rest of the day. You are willing to work an extra half hour at the end of the day, or simply only be paid for 7 ½ hours a day. Given your mental health this request is quite reasonable, however maybe your boss does not have the ability to O.K. a schedule change like this, or perhaps you have in the past already made this request and the answer was no, therefore you would be violating the boss/employee relationship by asking again or the timing is off. Of course that doesn't mean if circumstances where to change that you could not ask again. I think we get the point here, taking these 9 factors into much consideration will help you to reduce indecision, which we have found to be a stumbling block for effectiveness. This same principle applies to knowing when to say “no” to a request as well. Ability – The question here really is, is the person able to give me what I am asking? Or, am I able to give what someone is asking of me? We are not asking do you want to, or are you comfortable, rather it is literal. Does your boss have the say-so to change your lunch schedule? No? Well then he/she is the wrong person to be asking. Are you able to pick up your sisters kids from school on Friday? You have a car and no appointments, so yes you are able! That does not mean you have to. Looking over each factor and being prepared to explain to her why you have chosen not to will go a long way in keeping the peace when she hears that your answer is “no”. Timing – This seems to be a no-brain-er, is it an appropriate time to make the request (or is this an appropriate time to say “no”)? Sometimes this can be more complicated than it seems. You may feel with hot intensity to strike up a conversation with your mate after dinner about a conflict the two of you seem to have often. You may even have a great idea and want to try it out immediately, however – be cautioned. Your mate may have had a long conversation with his mother before dinner and feels exhausted over the things that he should or should not be doing, you do not want to add to that stress, and making your request right then, will only do just that. Equally as poor in timing is, that although you will be working on making time for your mental health throughout the week translates into telling your sister that you will not be picking her children up after softball all week, every week, it may not be the proper time to do so when she is waiting at the hospital with one of her other children getting stitches. So timing is important, it may not always be the deciding factor, but it does need careful consideration. Clear – Something that is quite important in skills for life really, is being clear on things. Both sides of the street. Are you clear on what you wish to ask of someone? Can you convey clearly what your request is? Have you got your ducks in a row and are aware of what your request entails? Unclear requests often are disregarded or not taken seriously. Likewise, if you are considering accepting an others request, are you clear on what you are getting yourself into? Do you know what will be expected of you? To give someone justice, you really ought to hear them out and ask them clarifying questions about their request of you so that you truly can determine if this is a time to say “no” or if it is a time you should say “yes”; knowing what all is involved will help with this decision. That door swings the other way, letting the other person know what is all involved in your request of them can help them to determine whether they can grant you that request. Authority – Honestly this has to be one of the easiest to answer, yet one of the most complicated to apply. Let me explain, your boss is obviously in authority over you, and as it relates to your job performance, you would comply, right? Wrong. Yes, many times over that would apply, but there are times when your boss may be making a request of you with regards to your job performance, but at the same time be undermining your self-respect. (have a peek at January 31st - February 7th, 2010 post for details on this conundrum) Although the door does swing the other way on this one too, there is another little glitch that needs to be addressed here, when you are deciding whether to make a request, you also need to consider if you are in authority over this person, would it be an abuse of that authority by making your request? Some of these principles sort of tie into one another, this concept is touched on a tad in relationship and honor. Ethical – Simply put, is your request reaching over the law? Moral values of another person? Or is what someone is asking of you doing either one of these things? Being ethical involves much consideration because although you may feel really strongly about something, if you know it will violate someone else's values then it would be unethical for you to ask. Clear and simple, you will have to find another way to get your needs met. Relationship – What is your relationship with the person with whom you are making the request? (or what is your relationship with the person with whom is making the request of you?) This question weighs heavily on your decision. If you have written out a recovery plan and you have decided for mental health reasons that you need a 'download' time before bed. You have called a few support persons and they have agreed to give you an ear for 5-10 minutes each night. You also have a decent relationship with your boss and have at times sort of sounded off to her, your relationship with your boss however would dictate that it would be inappropriate for you to ask her to hear you out three times a week before bed. Granted as with anything there are always exceptions to the rule, but generally speaking of course this would be a request that doesn't really fit the relationship. Interchange – The easiest way to dissect this one is this, do you give to others? This person you are making a request of, are you giving to them in value, what you are asking of them? Do you have a friend that gives you rides to all of your appointments, the grocery store, clothes shopping and yet you do not give them gas money or an exchange for their generosity, or you do not give them much time when they call and want to chat about how their day is going,?Chances are they will refuse you if you ask them to be your evening 'download' support person. Or are you in the role being asked to be the support person, this person gives you his time, energy, resources to get you to your appointments, are you giving something in return for his generosity? Or should you grant his request as a way to say “thank you”? Objective – This one does not get any plainer, will you making this request get you further or closer to your objective in the short term? In the long term? How much and what kind of impact will this have on your progress? Will you saying “no” get you further or closer to from your objective in the short term? In the long term? How much and what kind of impact will this have on your progress? Honor – Are you the type of person that cries wolf? Is there always some big dramatic issue in your life? Are you regularly calling everyone in your contacts list and fanning the flames of your dramatic existence? You will probably be met with a lot of “no's” yourself and therefore it would do you well to reconsider asking anything of anyone for the time being, you have much to work to do with just yourself. However, most of us are not that way, I use that as an exaggerated example of honor. We need to be honorable with the people around us, so that they know when we ask something of them, we have seriously contemplated the request and it means something to us, we can be taken seriously. Although, I know that each one of you, when you read this example you had a teeny tiny recognition of a person you know! We don't want to be that person. Honor also has another angle, if you have in all most all other areas seen that you should say “yes” to the request being made of you, but it boils down to you knowing that you will have little to no self-respect if you do say “yes”; then it would probably be a good idea to say “no” and then spend some time on evaluating why it is that your self-respect would be hindered in that way. Damaging your self-respect can have drastic consequences and can undo much hard work. The flip-side to that though is we do not want to bail-out of granting a request by flying the 'self-respect' flag either. Get to the bottom of it and find out why your self-respect will be lessened and try and explain it to the person or persons asking, or maybe even work a little on exposure therapy . . . ah, but that is another post entirely! Clearly now you can see why it is so helpful to consider each one of the factors carefully before saying “no” or before making a request of someone. Just simply breaking down your decision this way can really pull the emotional attachment out and let the decision that needs to be made set naked on a table so that you can look at it from all angles and calmly make a choice. This is quite a lot to take in. Digest it, read it over, take some recent situation that went well and compare it to the checklist then take a recent situation that did not go well and compare it to the checklist, find out where your strengths are int his department and where your weaknesses are. Get acquainted with them, this education can make all the difference in your next encounter, whether it goes effectively or ineffectively!